This is it! to all aspirants Pinoy out there, this is your chance to show your guts to become one of the Pinoy Big Brother season 5 housemates. PBB Season 5 online audition is now OPEN and all you need to do is to meet the requirements stated below. The PBB5 online audition requirements should be in video format and follow the mechanics here. 1. Make sure that your face are clear to see in your video entry. 2. It should be Close up with mid shot not in a extreme close up with full shot of course. 3. Make sure that your voice is clear and easy to understand with no extra noise. 4. Your video length must not exceed to 1 minute. You must say your Name, Age, Address, Job or Course, and answer the question: "Bakit ka karapat-dapat maging housemate ni Kuya?" 5. No video effects, sound effects or background music. 6. Be yourself, be natural. If you meet all the requirements, you can send your video entry to the following e-mails. Download PBB Season5 Questionnaire, Waiver & Release form here! Download PBB Teen 5 Questionnaire, Waiver & Release form here! For the meantime, please bookmark this page now or visit this site more often for you to be updated. 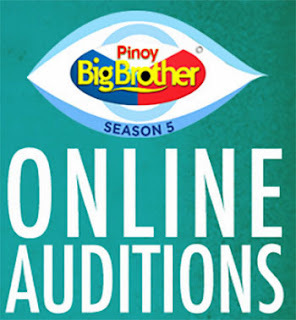 You may also share this post to your friends so they may know about the Pinoy Big Brother Season 5 Online Audition. Comments or suggestions about "Pinoy Big Brother (PBB 5) Online Auditions (Video Format)" is important to us, you may share it by using the comment box below.